Happy Geek Pride Day, my little ponies! If you didn’t know, May 25 marks Geek Pride Day. Why this particular day? I’m not sure, I just remember reading about it on the interwebs last year. The More You Know cue shooting star! 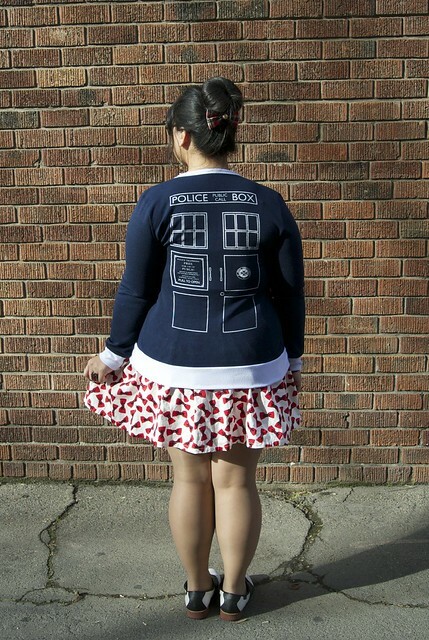 And since it’s Geek Pride Day, I thought it would be appropriate to show off my 11th Doctor inspired outfit! It’s one of my favorites that I’ve definitely worn more than once. Oh, and DOCTOR WHO IS COMING BACK IN AUGUST WITH PETER CAPALDI AS THE 12TH DOCTOR!!! I’m still upset with the horrific send-off Steven Moffat wrote for my beloved 11th Doctor. Like seriously, the 9th Doctor had a great send-off, and the 10th Doctor had a magnificently perfect send-off (so, so good I cried! ), but the 11th Doctor? I didn’t even cry because I was too confused with what the hell was going on and the episode was such a snoozefest. Surely I can’t be alone on this, right fellow Whovians? Anywho (ha! see what I did there? ), I’m heading off to New York tonight and I’ll be there for a whole week with my sister! I’ve been wanting to go to New York City ever since I watched Home Alone 2: Lost in New York, so childhood dreams are coming true, my ponies! There are so many things we want to do while we’re there, but two are set in stone — we’re watching Bullets Over Broadway starring Zach Braff (EEAAAGGGLLE!) and going to BookCon‘s kick-off panel for Jonathan Tropper’s This is Where I Leave You and Tina Fey and Jason Bateman will be there to talk about the movie adaptation they’re starring in. I WILL BE BREATHING THE SAME AIR AS TINA FEY. WHAT IS AIR? I DON’T KNOW ANYMORE. BUT I WILL TRY AND BREATHE IT. And then we’ll be going to BookCon the following day and John Mother-Fuggin Green is gonna be there. TINA FEY AND JOHN GREEN. I CAN’T EVEN, YOU GUYS. LIKE, I JUST CAN’T. Such a cute outfit! I love it! 😀 Perfect for today! 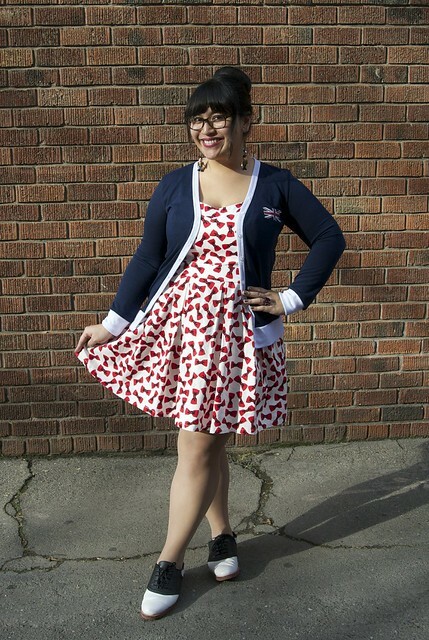 Love this ❤ Perfect nerdy cardigan and shoes. Such a cute print on the dress! I can't believe you met Zach Braff! I nearly died when I saw the photo on Instagram. Haha. Lucky duck!